Africa Trends is the IDSA's Biannual magazine on Africa. The magazine aims to provide readers with reviews and analysis of significant and strategic developments taking place in African countries that impact regional and global security. The publication features commentaries and analyses of contemporary developments in Africa and a Book Review section. 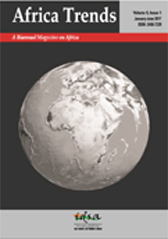 The Africa Trends team invites book reviews and commentaries for publication in upcoming issues of the magazine. Submissions can focus on political and economic issues relating to African countries. We would also be interested in articles analysing bilateral, regional and multilateral developments of strategic significance to India's engagement with African countries. Commentaries can range between 1,000-1,500 words (excluding footnotes) and book reviews between 600-1,000 words. Contributions may be emailed to the Editor at idsa.africatrends@gmail.com. The submission should be emailed as a Microsoft Word document. The first sheet should carry author details (a brief resume of about 50 words, institutional affiliation, and email address). A signed declaration of originality and conformance to research ethics should accompany the submission. Authors must also confirm that the submission has not been sent to any other organisation for publication. If actual statements or phrases are taken from another paper, the name of the author should be mentioned in the text and the chosen material should be placed within quotation marks with an appropriate reference. Alternatively, if another author's views are to be summarised, use the formulation: 'The views of xyz are summarised'; give a crisp summary. References/Endnotes should be sequentially numbered; authors are responsible for accuracy of the references. Please follow the citation guidelines below. Meena Singh Roy, "Building a Peaceful Asia," in Jasjit Singh (ed. ), Reshaping Asian Security, Knowledge World, New Delhi, 2001, pp. 348-61.